Together with the Karolinska Institut we published a couple of month age a report examining the patient access of cancer drugs in Spain. 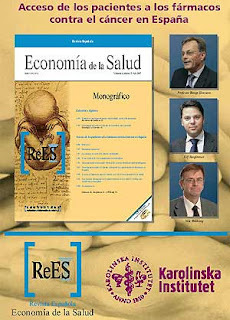 The report caused an interesting debate in Spain about regional inequalities in patients access to novel cancer drugs. The Spanish minister of health, Elena Salgado, recently cited the propositions made in the report as appropriate measures in improving the situation. It seems to me that this type of evidence is a unique way of adressing economic issues beyond the individual cost-effectiveness analyses of drugs that may not have the desired impact on a macroeconomic scale in securing funding for innovative cancer medicines. I am sure we see more projects of this type also in other disease areas..
See also my interview with El Mundo (in Spanish).